There's a new update to the Google Phone app rolling out to Google-supported devices (e.g. Pixel, Android One, etc. ), and this one brings a long-awaited feature: Chat heads. More specifically, this is the floating widget with the contact photo of the person you're talking to. Also coming in the future, or possibly already live for some, is support for the new Real-Time Text protocol. Google has been experimenting for months with a floating widget to its Phone app, similar to that of the chathead feature made popular by Facebook Messenger. While it was an interesting feature, the only way to use it up until now was with a modded APK or other hacks. That changes with version 17. There isn't currently a setting in the Phone app to completely disable the floating widget. However, if you would like to get rid of it, there's a simple trick. Just find the list of apps that can "display on top of other apps," which you can search for in the Settings app on your phone, and disable that feature on the Phone app. It won't impact the ability to be on a call, but it will prevent the floating bubble from showing up. If you're not hearing or speech-impaired, or working in a few very specific industries, TTY probably doesn't mean much to you. In the context of phone service, it's basically a protocol for transmitting text over a live call. TTY was essentially designed for use over landlines, which means it didn't age very well as more and more people switched to cell phones. In April 2016, the FCC set a target to implement a replacement for TTY, which was called RTT, or Real-Time Text. The deadline was set for December 2017. We don't need to go into all of the features and benefits of RTT, but its main feature is exactly what it sounds like – each letter you type is immediately transmitted to the other side of a call. This has the obvious advantage that you can begin typing and readers have the opportunity to deduce your message before it's finished. Not only is that often good for regular conversation, it can also save critical time when you're on the line with emergency services. Judging by some new resources and a boatload of code, it looks like Google either has RTT support ready to go, or it's getting pretty close. The majority of evidence is in a series of layout files and code, so it won't be included here. It looks like most or all carriers do support RTT, but in my quick tests, I didn't see a way to activate it. 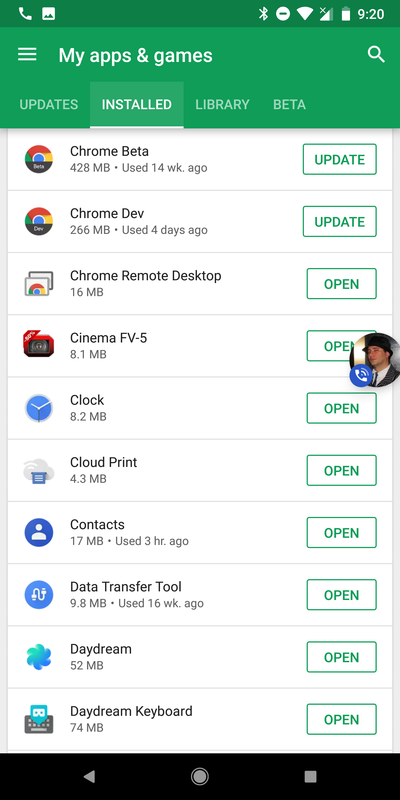 My suspicion is that Google is rolling out partial support in this update to begin testing, then may activate it remotely or with an upcoming update. It may be worth mentioning again, this is technically a feature primarily designed for users with hearing or speech impairments, but RTT can still be a very useful feature for everybody. It may be somewhat competitive with RCS, once it's more readily available, but a lot of people should be able to get some value out of it.